Clarify 2 ManualClarify Desktop Sharing DocumentsHow do I share Clarify documents? Clarify offers a number of different ways to share the documents you create with others. 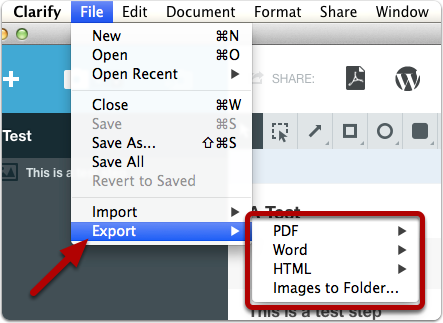 From the File > Export menu you can export your document as to PDF, Word, or HTML. Just select the template you would like to use from one of the menus. 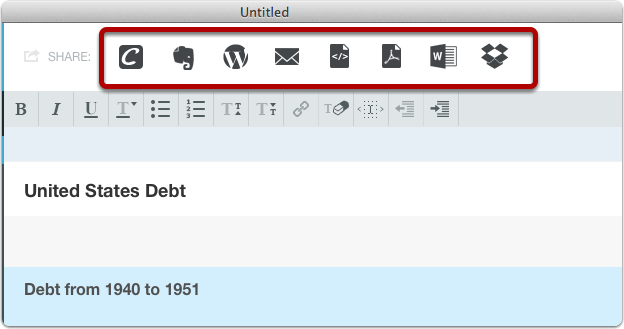 For PDF, Word, and HTML sharing accounts, you can specify which template to use so you don't have to select one each time. You can also do things like select a logo to include and specify the text to put in the footer. To learn about creating a sharing account please see the article Creating a sharing account. Prev: Can I change the text size of words in the article description or step instructions?